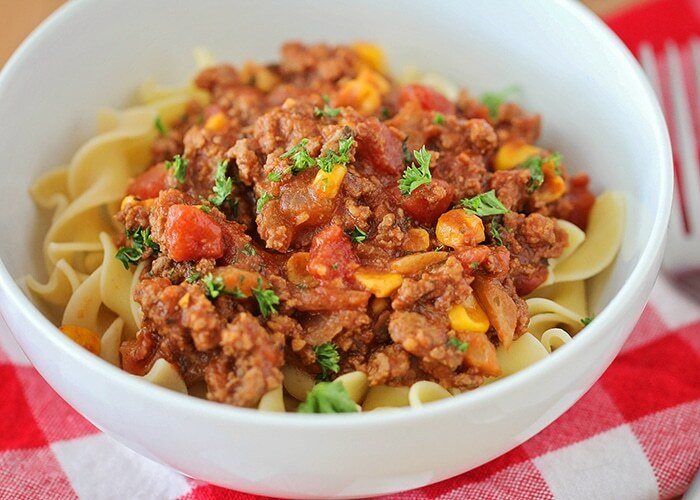 American goulash is filled with hearty ground beef, pasta, tomatoes, corn and tasty spices! Ready in 30 minutes or less this easy homemade goulash recipe is the perfect comfort food during those cold winter months. 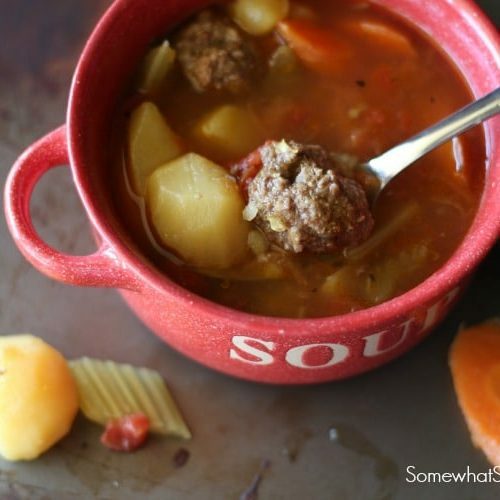 Goulash is one of my all time favorite meals to make for dinner. Some of my other favorite comfort food recipes is this hearty Chicken Noodle Soup, Homemade Meatloaf and this Pepperoncini Pot Roast. American goulash is one of my very favorite comfort foods. 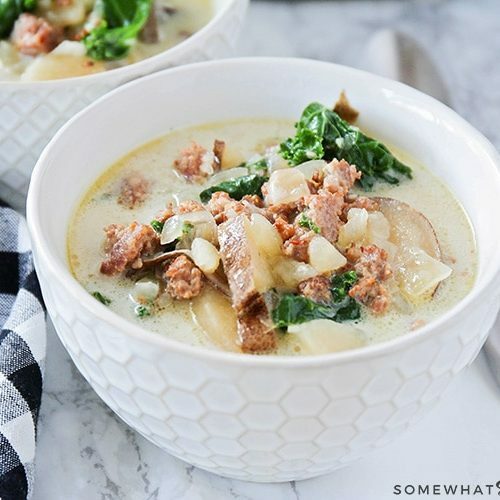 Growing up my mom would make this all the time for our family and it was one of our favorite things to eat; especially when it was cold outside. 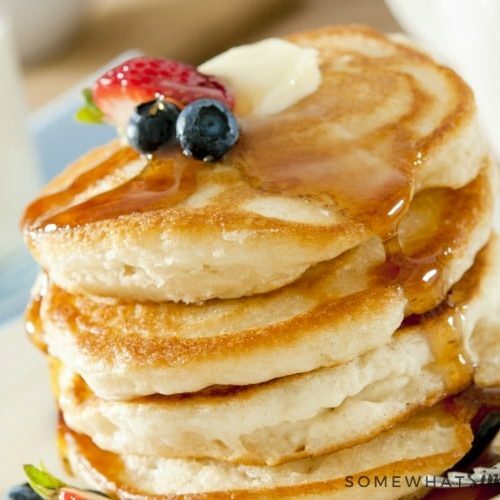 It is tasty, filling, and super easy to prepare! 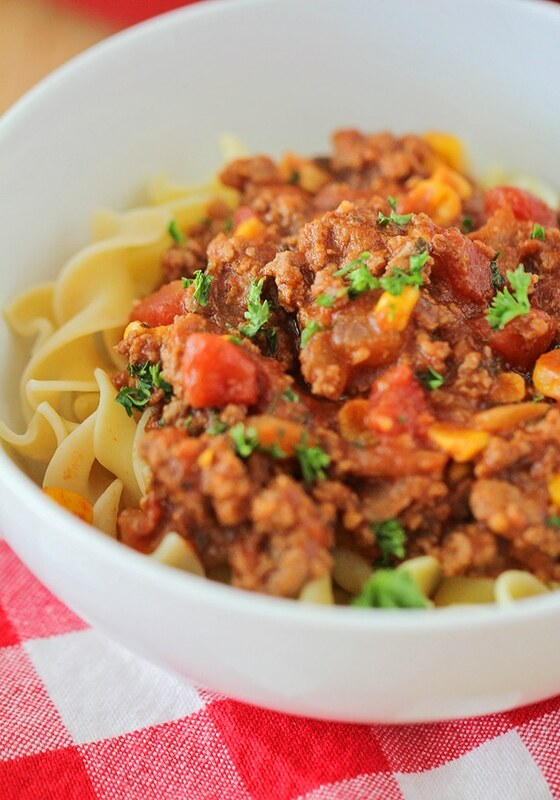 Filled with ground beef, pasta and delicious spices, this particular recipe is one of my all-time favorites. It whips up in 30 minutes or less but tastes like it’s been simmering away all day long. It is so delicious!!! Goulash is a traditional Hungarian dish that is similar to meat stew filled with potatoes and other vegetables and flavored with paprika and other seasoning. 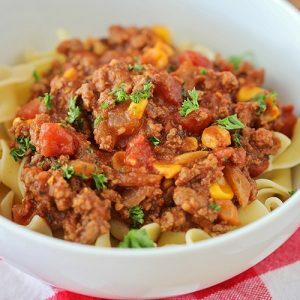 Hungarian goulash (aka old fashioned goulash) isn’t typically served with noodles but this American goulash recipe is made with a delicious bed of pasta. Combined together it makes a hearty and delicious meal that my family and I have been enjoying for years! 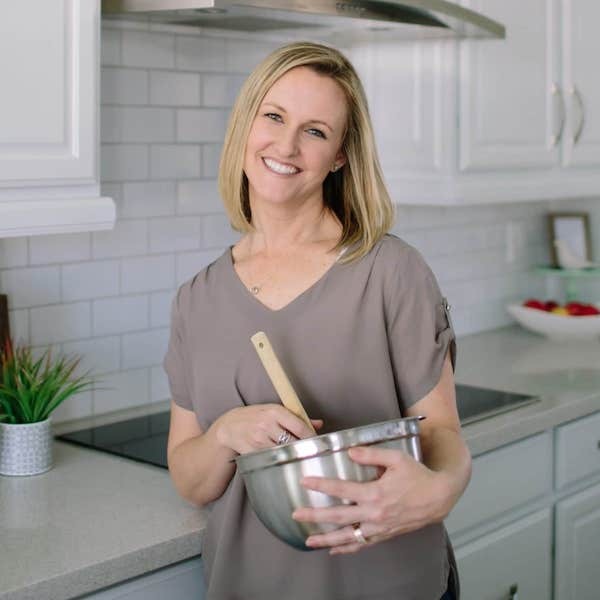 Life always seems to be really busy, so I love to keep my recipes simple and this American goulash recipe is an easy one. It doesn’t take long to make it so you’ll be ready to sit down for dinner in no time. Here are the simple steps for making this recipe. Yes, you can easily freeze this recipe to use later. Once the goulash has completely cooled, put it in an airtight container that is safe to put in the freezer. 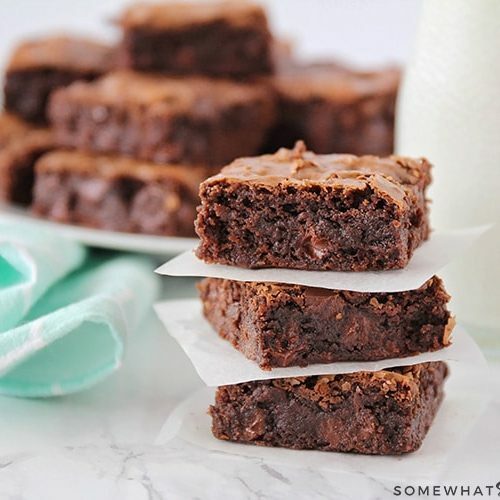 I typically just use large Ziploc freezer bags to store this recipe. You can keep this recipe frozen for about 2 months. When you’re ready to use it, heat it in the oven at 350 degrees F for about 30 minutes or until it is warm all the way through. If you’re like my family and you don’t have enough to freeze for later, simply place the left over American goulash in an airtight container and keep it in the refrigerator. It will stay fresh for about 4 or 5 days before you’ll need to toss it. When you’re ready to eat it, I usually just warm it up, in 30 second increments, in the microwave until it is warm. 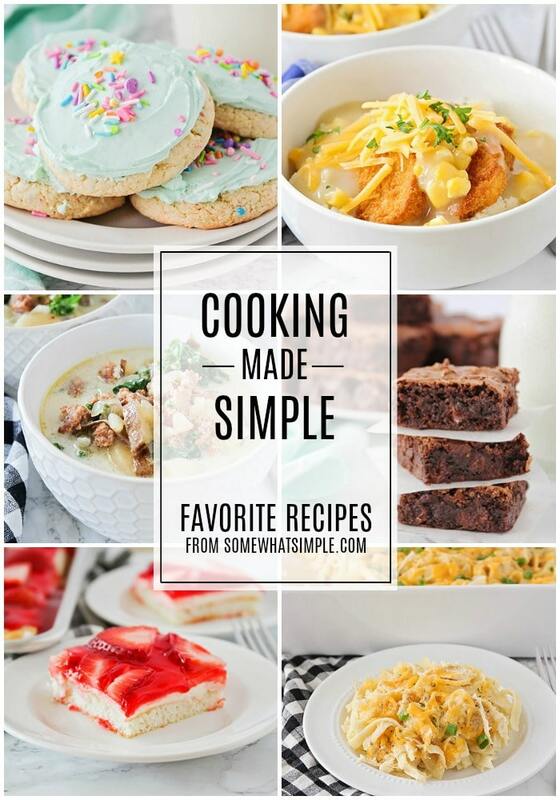 Now that you know how to make this easy recipe, give it a shot! 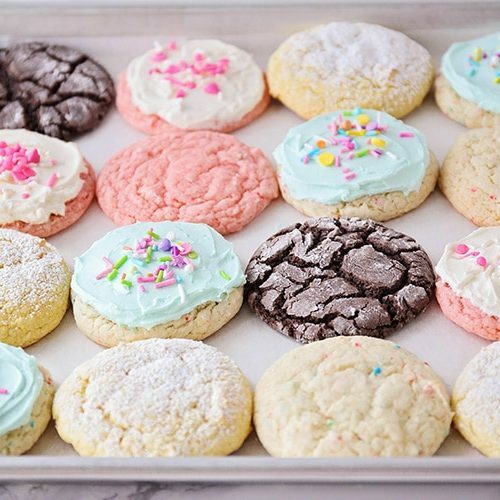 Let us know in the comments below how you liked it and if you made any tasty variations. If you’re look for a fun and festive way to dress up this American goulash recipe in the fall, take a look at our Halloween “Ghoul”ash. 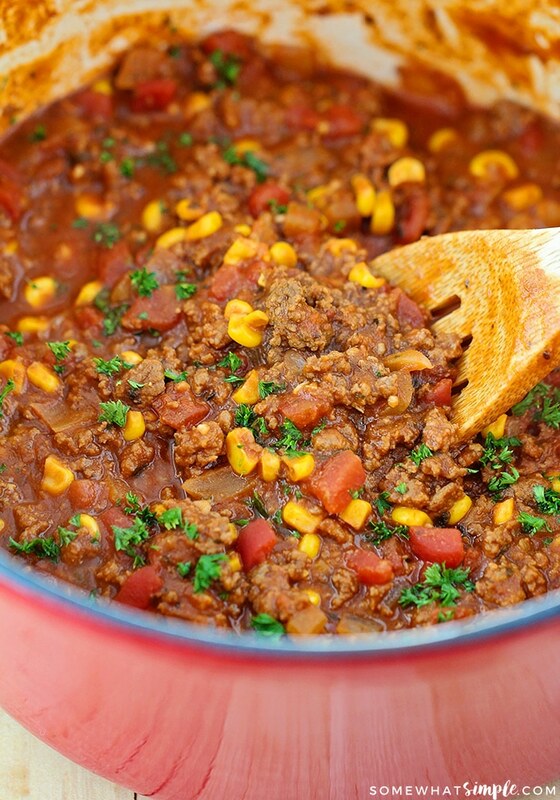 The way you make homemade goulash is about to change forever! 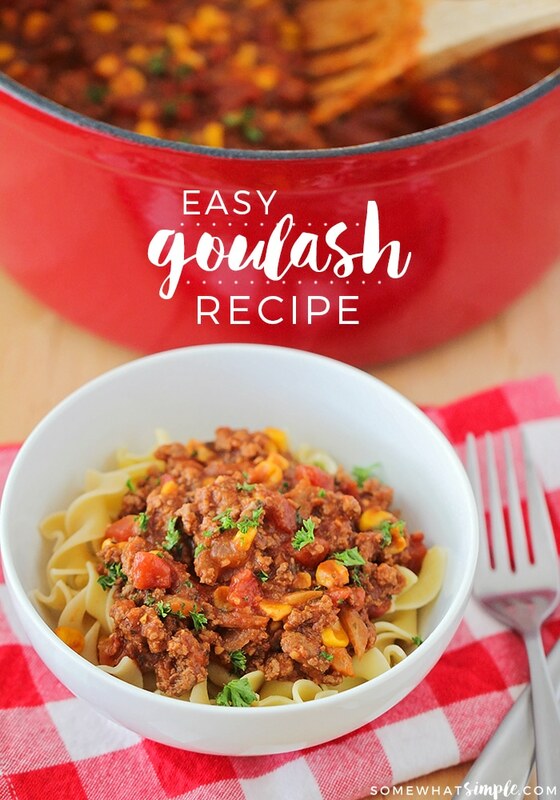 This easy goulash recipe whips up in 30 minutes or less and it is DELICIOUS!! Heat oil in a large saucepan over medium high heat. Add the onion and cook, stirring occasionally, for about 3 minutes or until the onion starts to soften. Next, add the diced green pepper and cook for about 3 minutes. Add the garlic and sauté for 1 minute longer, stirring constantly. Add the ground beef to the pan. Brown until the meat is almost fully cooked (about 5-8 minutes). Add the tomato sauce, tomato paste, salt, pepper, red pepper flakes, and frozen corn. Bring to a low boil, then reduce to a simmer over low heat. Cover and let sauce simmer for 10 minutes, stirring at the 5 minute mark. At the very last minute, stir in the fresh basil. Thanks Courtney, so glad you enjoyed it! My family LOVES this goulash recipe!!! We have it for dinner at least a couple times a month!! SOOO GOOD! I’m so glad everyone loved it! Thanks for sharing! 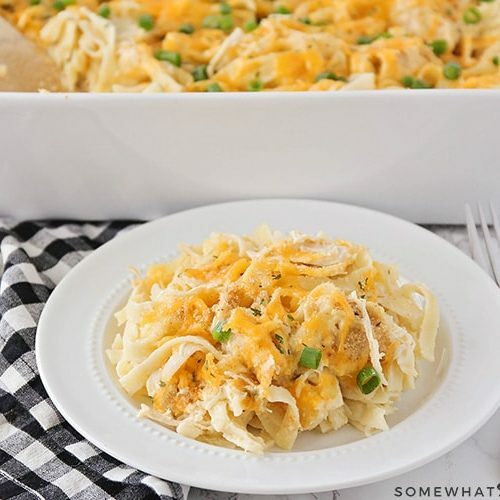 This is perfect for a weeknight meal! Can’t wait to make it for my family. 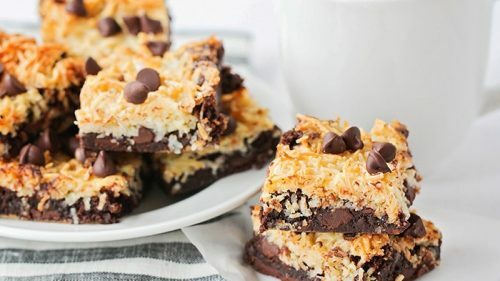 This is the ultimate comfort food! My family would devour this! Super excited to have this recipe for a delish weeknight dinner! Thank you!